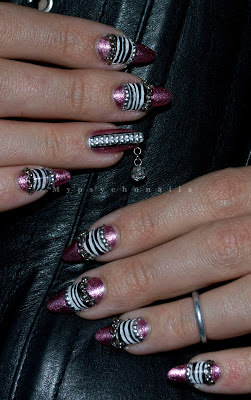 Lately I noticed chain or studs nails are very popular and a lot of time has passed since I did the last manicure featuring these (Chains and studs nail art) so I thought the time has come for a new one! It is easily done. The black stripes on a white background painting is done with acrylic paint and the studs are stuck on with topcoat. Regarding the chain pieces, the first time I wore them I stuck them on with topcoat too. I don't recommend it. They will fly away in about two days. This time I used clear acrylic but they still tend to come off. I think the best solution is nail tips glue which I'm going to try next time. And, of course, "the piercing" :D I love anything that clanks and hangs and I even wore a nail piercing some months ago but it isn't ok for natural nails. The hole will get bigger and bigger and you will have to cut the nail, besides the fact you need help when putting on the ring. Anyway, an obsessed girl always finds solutions :)) I put some rhinestones on an acrylic bead, I attached it to the little chain and stuck the whole thing on the back of my nail.